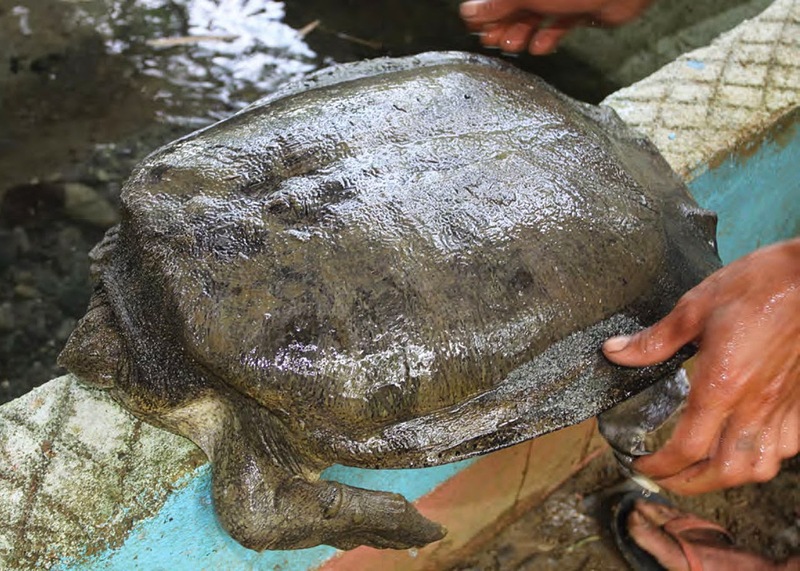 The Cantor's giant softshell turtle (also known as Asian giant softshell turtle) is a fresh water turtle that used to inhabit India, Bangladesh, Burma, Thailand, Malaysia, Cambodia, Vietnam, China, the Philippines, Indonesia, Papua New Guinea, Sumatra, Borneo, and western Java. However, for the past decade, sightings have only reported in Laos. It was last seen in the Cambodian wild in 2003. The species inhabits slow-moving fresh water streams and rivers. There are indications that its range may extend to coastal areas, as well. This strange looking turtle is named after Theodore Edward Cantor (1809–1860), a Danish physician, zoologist and botanist. It should be mentioned that the species is not well studied and certain data indicate that it may actually be composed of several taxa. 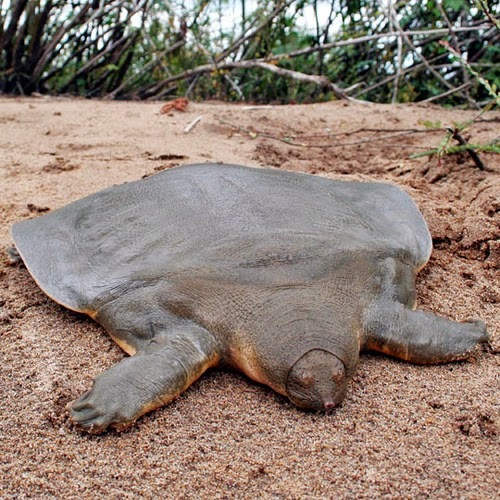 Cantor's giant softshell turtles spend 95 % of their lives stayed buried and motionless, with only their eyes and mouth protruding from the ground level. They surface twice a day to take a breath. 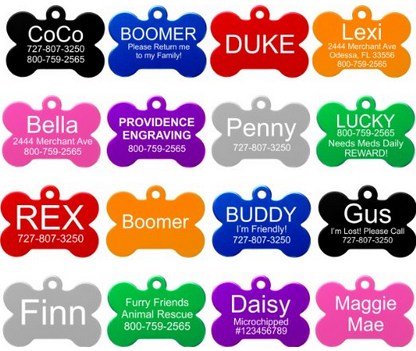 They are powerful ambush predators, with a strong and fast bite capable of crushing bones! After mating, females lay 20 to 28 eggs from February to March on riverbanks. These eggs have a diameter of 3 to 3.5 cm (1.2 to 1.4 in.). The species is listed by the IUCN as endangered, having disappeared from areas where it once was abundant. Recently (2007), it was found that a large population resides in an area of the Mekong River, along a short 30-mile (48 km) stretch of the river. Direct exploitation, habitat loss and illegal collection are to be mainly blamed for their continuously declining numbers. It can be found for sale in all markets in coastal areas of Bangladesh ,while in Indonesia is traded at low but steady volumes. The species is traded for its meat, eggs, decoration, traditional/alternative medicine, even as exotic pets. A large portion of caught turtles is probably sold to international traders. They are very easy to catch, with poachers using bamboo traps, hunting dogs, and by burning brush. Unfortunately, few measures have been taken to protect the species survival. One of them is the opening of the Mekong Turtle Conservation Centre (MTCC) in June 2011, which has given researchers some hope that this rare, strange-looking turtle may be saved from the brink of extinction However, sightings get more rare and rare and the species future looks bleaker each passing day. - According to some reports, their bite is faster than the bite of a Cobra. - Webb, Robert G. (2002) "Observations on the Giant Softshell Turtle, Pelochelys cantorii, with description of a new species." Hamadryad. 27 (1): 99-107. I think this turtle is very different from all of the other turtles that I have seen or read about but eather way I do think this turtle is great it is just so intresting for people to learn aboutand I am one of those people. IT ISN'T COOL IT'S INTERESTING!!!!!!!!!!!!!!!!! Strange in a cool way!